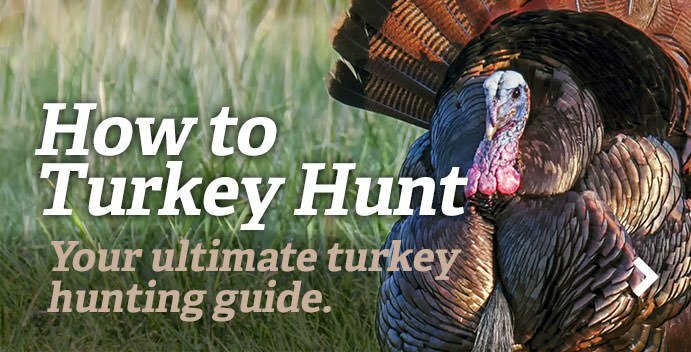 Calling wild turkeys to your setup position is the essence of this tradition. But sometimes it's not enough. Tired of that longbeard tossing you courtesy gobbles? Sure, that bird might be henned up. It might also not like the view between where it struts and where you sit. Your yelps sound great, but the turkey can’t get to you. Before you plunk that seat cushion down, visualize the possible path that vocal bird might take to your position. Is there a game trail the longbeard might use? If you’ve found fresh sign on it, that’s a good bet. Is there a fence row it might slink along, looking for the hen you’re imitating? Flank it. Maybe that turkey will come through the open woods? Be there waiting. Other questions linger: Will it hang up on a creek? Get stifled by that fence? Does it have a hill or two to climb? If so, reposition. Your calling might sound great, but it’s nothing if you don’t put your setup in a desirable location, one a hen might frequent. It pays to think like a turkey. In the end, calling is important, no doubt. Still you’ve got to imagine how that gobbler will come to you, much as a football coach diagrams a play. Will things always play out according to plan? Not always. You increase your odds when sitting in a place a turkey might also stand. Two spring hunts come to mind — different years; both in Wyoming — that illustrate the importance of seeking out a level playing field. The first hunt involved a sure bet that turned real tough before the unexpected big play happened. The guide knew the land. My buddy and I had the pent-up desire all of you share in spring turkey season. The sure bet involved a huge flock of turkeys that roosted on a side hill off a game trail not far from an access road. “The landowner sees them here in the woods every day,” our guide assured us, so we slinked in early, and set up in the dark. A calling clinic greeted us at first light, and I smiled at the ease of this hunt. We answered back with tree calls and soft yelps, and to me, we sounded great. That was until the fly-down calling racket gathered behind us then faded up the high mountain. Gone. We’d picked the wrong setup location that morning. “Let’s go,” hissed the guide and we followed, navigating the winding, twisting game trails to the top of a towering meadow. A hike would be an understatement. On top, you guessed it, we unintentionally busted the flock in our haste to make things happen, and they exploded like a covey of two dozen 10- to 20-pound quail. The guide wanted to go somewhere else, but the fall turkey hunter in me said these busted spring birds might want to reflock. “I dunno,” he groaned, but my buddy was game, so we set up. Us. Them. An even playing field. We set up, called, and sure enough, a lonely gobbler hammered back. Pfft-dummm, just over the rise. I repositioned to see a full fan, no more than 10 steps away, on a little green overhang the size of a pool table. When the longbeard turned away, head now behind that full fan, I snapped the safety off. Clucked once. Gobbler head up. Bird down. We slipped halfway down the steep mountain to another hidden meadow, also above where the big group had roosted and given us the slip. In a matter of seconds, we raised a loudmouthed gobbler. That bird came along the big open pasture, gobbling, strutting, and working in. Had it been with the morning group, and with the bunch we’d flushed and spooked? Yes. No. Maybe. My buddy’s went 23 pounds, huge for a Merriam’s. Twice we had to adjust to get on an even playing field with the birds; twice we scored doing it. The calling and positioning did the trick. They were field birds. Osceolas. Henned-up gobblers with plenty of company. In order to call one of these longbeards to my position I’d have to meet them in their bedroom. Impolite of me, but you know turkey hunting. I made my way through the cricket-black, pre-dawn pasture, my flashlight initially dogging the dewy ground to avoid cowpies, culverts, and cottonmouths. Mission accomplished. I didn’t want to get too close at first. I also didn’t want to be too far away, because those hens might just lead the longbeards away. I owled with my voice: nothing, unless you count two real barred owls that winged in to land above me. Silhouetted against the moonlight, they joined in the locator call chorus. Then more silence. Not long after, as the first light seeped over the pasture, I heard soft raspy tree yelping: a hen. Still mostly dark, I assessed the terrain; new to me, it was only the second time I’d been there, and the other time was in daylight while scouting. Fenceline. Trees and brush behind it. I could slink along it toward the roost and stay unseen. I noticed a creek just on the other side, and reasoned they’d fly down to this side, right where I planned on waiting. I found a good place to set up along that barrier, just inside some palm fronds which conveniently hung down next to what I imagined to be a landing pad for the roosted turkeys. I softly yelped with a hands-free mouth diaphragm. The hen answered. It’s then many others chimed in: more hens. Then came the sound I’d waited for: one, then several gobblers clearing their warty throats. One was no more than fifty steps off my left shoulder, with me facing the open field. I called softly. They answered loudly. I shut up. At fly-down time, a burst of wings sailed in to my left: the sound of air rushing through wings. Hens — a bunch of them. They moved off a little. Round 2, a big hen sailed off the roost far into the center of the field. Was she onto me? Would she blow my plan? I still didn’t call with the wad of hens not far away. It’s then a whoosh of big wings came in, a gobbler, long of beard and standing 15 steps in front of me. The tom stopped, head juking, looking far off, obviously seeing the big hen way up the pasture. He strode in that direction, and then I called, softly, surely. At that he wheeled, coming back. He returned exactly where he’d flown down. I clucked, and that Florida tom periscoped up for a look. A sweet second passed and I pulled the trigger. Dances with gobblers can wear you out; beat you up; teach you a lot. They answered our yelping then drifted off. Again and again. Been there? Our calling sounded fine, and the prickly pear was taking its pint of blood as usual. Forget the snakes and other sharp stuff. We just weren’t where all these Texas turkeys wanted to be. Any of you out there who’ve had the pleasure of hunting Rios know that some of these big ranches are both beautiful yet repetitively similar from acre to acre; at least to us. Hill Country bluebonnets dazzle, but at times you have to wonder why those travel-hungry gobblers and their restless hens won’t stop and settle in for a spell. Maybe it’s the urge to hit water holes or feeders (legal in Texas) or maybe they just have restless natures. Any time I’ve hunted them they teach me something, Big country, lots of acreage, much of it the same. Why then do they answer your calling and leave? Why too do they eat up your calling when you ease into just the right place? I think it has something to do with small interior spots, hidden basins, and open fields, that appeal to them. You can blow them out of there if you approach too fast, but slink in just right, and bingo, you’re a winner. Back to the lead hunt. We called. They answered, moved off. My buddy and I kept easing along with them, and then, there before us, paradise. It was a big bowl fringed with live oak and mesquite and shady cover. Gorgeous. We slipped in on one side, and ran a box call. A gobbler on the other side, clearly one that had been answering us for several hours, appeared, stepped out, strutting. We called. He then shifted gears, came running, fish-hooking in. I swore he’d fall over himself trying to get to us. It was pretty much a 100-yard sprint. My next call, a cluck, stopped that Rio in a cloud of dust. My shot settled the matter. My buddy and I just looked at each other and laughed. “We got where he wanted to come to us,” was all he said. I had to agree. In Maine, I’ve got a couple spots that are certain to hold turkeys spring in, spring out. Both are surrounded by well-kept farms full of greened up fields. The terrain surrounding each one is a little hilly, though nothing by Wyoming’s mountainous standards. That’s where I find the gobblers that are willing to work. It’s gone like this the last two spring seasons on opening day. Like some of you, I scout my home ground 364 days a year then hunt that slam-dunk opener. Why? I know the land. I’m there all the time. I know that if I ease into the location on that first day, things will likely happen. I know how turkeys will likely come to the calling, and I set up where they want to be. Two seasons ago, I parked the truck late, well after fly-down time. I eased a half mile down into the woods. Gobblers ripped back at the first cold call. I set up, facing the far woods that held them. They came exactly as I expected: up the little rise, over the stone wall, into the flat where I sat. I had a longbeard by the feet in under an hour. Last spring season, I set up conservatively, in a location about a mile away on another farm, away from where I thought birds would be. Yes, sometimes I question my own tactical sanity, but I wanted to try something different. An hour passed, then another. Slinking down the pasture, I eased into a hilly spot split by a small creek and bottom: familiar ground. I cold called. A handful of gobblers answered, and it was a race to my position. I hadn’t seen a hen all morning and obviously they hadn’t either. The wad of gobblers, all nice birds, raced toward me through the crunching leaves. Down the little far hill, hopping the little creek, and striding to my position. Calling isn’t enough. Knowing the land, and how turkeys move through it, can seal the deal.